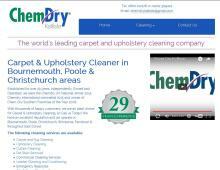 Chem Dry Kalliste provides specialist carpet cleaning and upholstery cleaning services throughout East Dorset. Carpets are cleaned and left almost dry by using less water than other carpet cleaning methods. Carbonated cleaning bubbles in the solution remove dirt and grime effectively. The power of this carbonated solution is used to lift dirt to the surface & then using powerful extraction equipment Chem Dry Kalliste fully clean the affected areas. Chem Dry Kalliste are specialist carpet and upholstery cleaners for Bournemouth, Poole, Wimborne, Ferndown & Christchurch. Contact Chem Dry Kalliste today to book your carpet & upholstery cleans.